Pitt was derided as a 'schoolboy' when he took office. Yet within months he had outwitted his opponents, and he went on to dominate the political scene for 22 years (19 of them as Prime Minister). No British politician since has exercised such supremacy for so long. Generally thought to be cold and aloof, Pitt was described by friends as the wittiest man they ever knew. William Hague succeeds in explaining Pitt's actions and motives during a series of great national crises, including the trauma of the Napoleonic wars. He describes how a man dedicated to peace became Britain's longest-serving war leader, how Pitt the liberal reformer became Pitt the author of repression, and how, though undisputed master of the nation's finances, he died with vast personal debts. With its rich cast of characters, and set against a backdrop of industrial revolution and global conflict, this is history at its most riveting. Engagingly read by William Hague who clearly admires his subject. 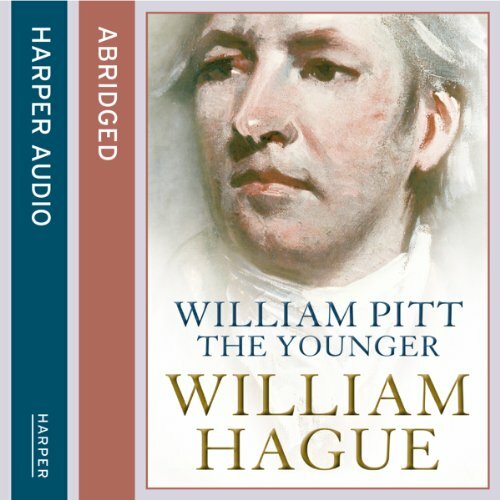 William Hague puts Pitt's life and achievements in historical context but never talks down to the listener. Hague is probably biased - he sees William Pitt as the founder of the modern conservative party - and at times he could be harder on Pitt's pragmatism and willingness to switch sides. The narrative never drags and the only issue with the abridgement is that at times major events seem to come from nowhere. I had to rewind a couple of times to pick up the pace change. As someone who has just got into politics, I've found it difficult to find books on Audio written by politicians. Thatcher's works have yet to be put on audio & Tony Blair has yet to write anything about his time in the klieg lights. And so there is this & what a book it is too. Written just after Hague had given up the unenviable job of being leader of a Tory opposition, it is simply written (with lots of explanatory material) & appears to have been thoroughly researched. Though I haven't read the unabridged version, this audio download seems to cover all areas of Pitt's life in adequate detail. And, as a bonus, this is one of those rare examples where the author reads his own book AND does a good job of it. Hague clearly has a passion for the subject & his voice is lively and intriguing, which keeps the narrative compelling. There is little to say in criticism, other than it is a pity that it is not a longer version. Burning 5 CD's though seems enough to give the subject sufficient length, without getting boring. So, if you're a political aficionado (like me) & you want something entertaining for long car-trips to work, then this seems to be the best on the market. The only thing comparable I can think of is 'Churchill' by Roy Jenkins, but in terms of modern day works by politicians, the market appears surprisingly sparse.